I write here and there when i get a chance.. thought maybe i could put it all in one place...??? lets see how long i do this before i forget about it and get side tracked. yeah with 7 kids it seems like i would be more organized but oh well. Maybe some day. This year Our family has made a lot of changes i finally said yes and got hitched.. lol.. I was married once before and well that was a mess. Don't get married when you are a kid it wont work. Now I married this boy from school. lol... always thought he was arrogant back then... turns out I was wrong . I hope lol.. After my first marriage of almost 12 years I was set on being single when I got divorced... I'm kinda of a control freak.. as in don't want a man to control me... don't want a man to abuse me.. and wont let my self get into that situation again.. so it took me forever to say yes to my husband... 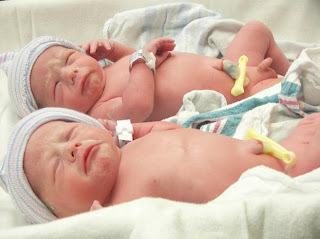 This year my husband and I welcomed twins to the world. while he was on leave and at the airport on the way home I went into labor.. amazing timing as they were only born at 34 weeks gestation and he would not have seen them til they were almost a year old other wise. he did not make it for the birth but shortly after. We bought a home got married and had babies all in the same year. poor guy wasn't even here to sign for the house. I send him pictures talk to him on email and messenger and Skye and he watches the babies first all from his computer in his chu (containerized housing unit) Thank fully we are not a military family that moves all around as that would be bad with 7 kids. For now I stay here on the home front raising babies and waiting for his return. his mom lives with me right now well that's where I'm at.. a story of how i got here would be much more dramatic and i would rather leave that behind me. and move on to better things..... My family, what we are and what we will be.